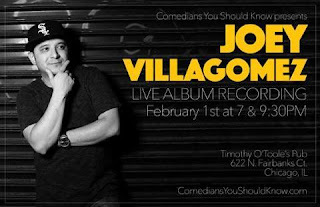 presents a live album recording, Feb 1st, for Chicago comedian, Joey Villagomez, who will be headlining two stand-up comedy shows. Both shows will be hosted by local Chicago favorites, Marty DeRosa and featuring Jim Flannigan. This will your only chance to watch Joey record his debut album "Doing Mexican Through a White Zone". Joey will discuss the funny parts of his life growing up a not-so-Mexican looking, Mexican-American kid in Chicago, as well as his experiences of fatherhood and marriage.